More than 80% of marine debris is microplastic (word of the year 2018 in spain). These particles accumulate in marine habitats, where this type of pollution extends from the coasts to the deepest waters seriously damaging the marine fauna. FIBERCLEAN™ is an R&D+i project led by Textil Santanderina that aims to reduce the emission of microfibers through the manufacturing and the life cycle of fabrics and garments. The project gathers manufacturers of filaments, yarns and fabrics; manufacturers of auxiliaries for textiles and washing, manufacturers of washing machines and detectors, and wastewater managing companies, closing the loop of the textile chain. In addition, we collaborate with two textile technology centers and a university to evaluate the results. SIMCA Project consists of a development of a remote monitoring and control system in real time for chemical and synthetic fibers, pioneer in the textile sector. It is based on a deeper analysis of the production process, combining intra and inter-company analysis in real time. Thus, increasing quality and allowing a global reduction of defects. 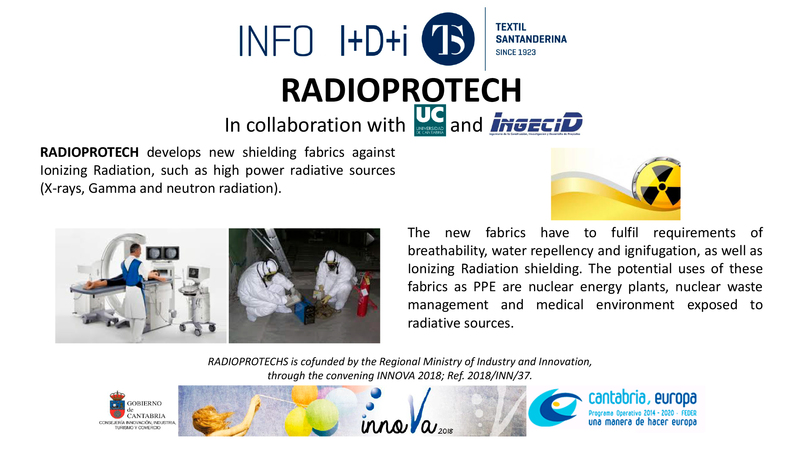 RADIOPROTECH develops new shielding fabrics against Ionizing Radiation, such as high power radiative sources (X-rays, Gamma and neutron radiation). The new fabrics have to fulfil requirements of breathability, water repellency and ignifugation, as well as Ionizing Radiation shielding. The potential uses of these fabrics as PPE are nuclear energy plants, nuclear waste management and medical environment exposed to radiative sources. RADIOPROTECHS is cofunded by the Regional Ministry of Industry and Innovation, through the convening INNOVA 2018; Ref. 2018/INN/37. The main aim of the project is to demonstrate a novel shredding process that allows the reuse of fibres from used clothing or fibrous waste from the value chain, to produce new garments using recycled fibres from waste garments. These recycled garments will have a similar quality as non-recycled ones. In addition, the efficiency of the manufacturing process will be improved, since it will be possible to reuse all waste generated during the manufacturing process along the whole value chain (it possible to increase the proportion of recycled material for manufacturing new garments by up to six times compared with what current processes allow). The project analyzes alternatives for spinning and weaving waste to manufacture activated carbon. The project is aligned with our objectives of sustainability, environment and circular economy. Activated carbon is a material in very fine powder form with a great capacity of selective adsorption of substances. Its applications range from water purification to environmental decontamination or protection of people exposed to chemicals. This is a highly luminous technical fabric which maintains its high-visibility properties after 30 washes and which also shows long-lasting phosphorescence. It is the result of a research project carried out together with the University of Cantabria. The research project was cofunded by the Regional Ministry of Industry and Innovation, through the convening INNOVA (INNPULSA 2012-2015). Ref. 2014/INN/013. FIELD (Fabric Improved against ELectrostatic Discharge) is a R&D project that will allow Techs to obtain new antistatic fabrics (ESD) and electrically conductive fabrics for both Personal Protective Equipment (PPE) and technical applications. Techstatic is an antistatic fabric resulting from an R&D project with 98% recycled polyester in its manufacturing and resistance to 30 industrial washes, making it far superior to the competition. GRAFENTEX National Project cofunded by the Ministry of Economy and Competitiveness (MINECO), through the convening Challenges – Collaboration 2013-2016. 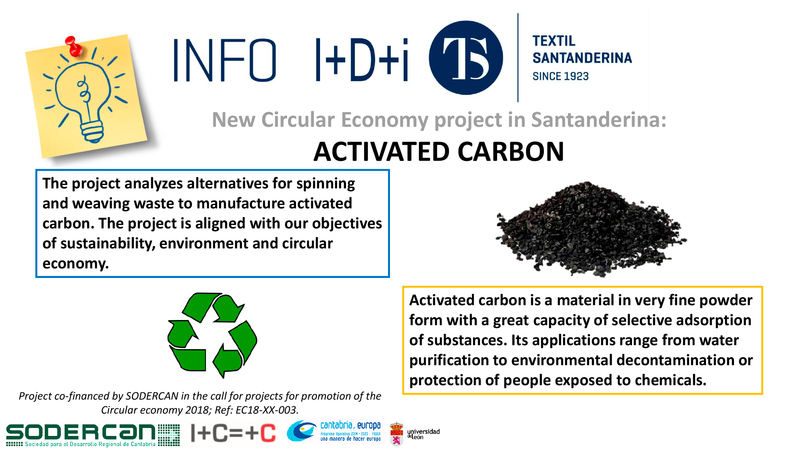 CTC and Textil Santanderina take part in an innovation project based on the optimisation of graphene production and its application in the fire resistant technical textile. The project, named GRAFENTEX, will allow to produce fire resistant textiles with a low environmental impact and high performance to Textil Santanderina, and will reinforce the european leadership of the company of Cantabria in the technical textile sector. The main aim of the project is to study and validate an innovative Integrated Solution for Warehouse Control and Asset Marking. Development and pilot validation of advanced internal logistics localisation solutions for integrated textile manufacturing processes. 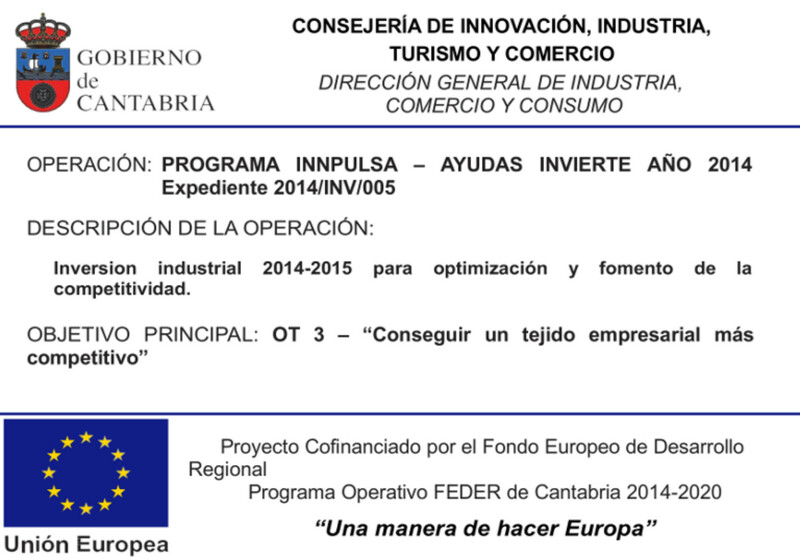 Industrial investment project 2014-2015 for the optimization and promotion of competitiveness. Project to manufacture recycled polyester from waste taken from the sea.